The wait for this Diamond League event since the last has seemed longer than usual. In this time, there have been many National, regional and various international events which have caught the attention of the athletics world in these past weeks. Notably, the US Trials which saw Galen Rupp return to winning ways, along with the Age Group Championships in the UK. The conditions in Paris were perfect, with this event set to be one of the best meets of the series, with the potential of multiple world records being broken as the worlds best of Genzebe Dibaba going head to head with Almaz Ayana in pursuit of the Women’s 5,000m WR. The event would start off with one of the big upsets of the day. The Men’s 400m looked to be going to plan with Kirani James easing past the majority of the field up to the 300m where he was challenged by the South African, Wayde Van Niekirk. 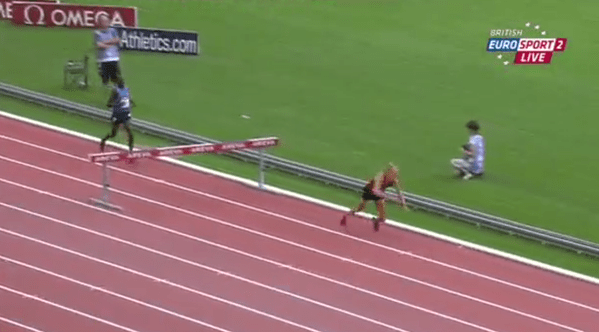 Van Niekirk would hold off James and came through to win in almost a WL time of 43.96 seconds which was a massive South African record as well. Next up on track would be one of the events of the night. Evan Jager was entered alongside the worlds best Kenyan contingency with the likes of Ezekiel Kemboi, the Olympic Champion also running. Jager, the world leader over 1500m with his 3:32 run a couple a weeks ago before the US trails would be targeting the US record which he already held at 8:04.71. Inevitably, he would slot in with the Kenyan runners going with the fast pace, separating away from the rest of the field in a group of four whitch would very soon become a group of two where Jager took the initiative to hit the front where he stretched away over the last lap looking set to win. However, when all seemed set to be a massive sub 8:00 clocking, Jager’s legs couldn’t withstand the impact of the final hurdle, collapsing to the ground. 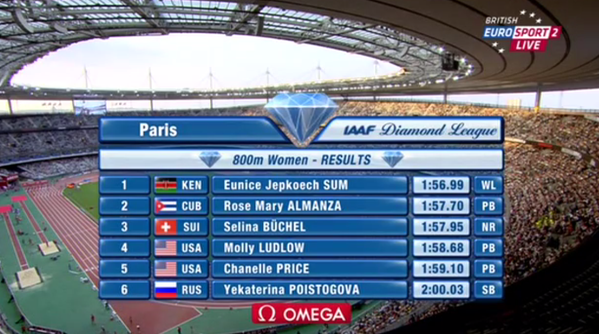 Birech came from behind to take victory in 7:58.83 but Jager still managed a strong AR of 8:00.45 for second. In the Women’s 800m, it was a strong pace from the start, hitting 600m in 1:27.15 where Eunice Sum would hit the front and not look back. She was always in control coming off the bend where she would dip under 1:57, running 1:56.99 making her the first women to run under 1:57 in two years, certainly making her the favourite for the World Championships later this year. 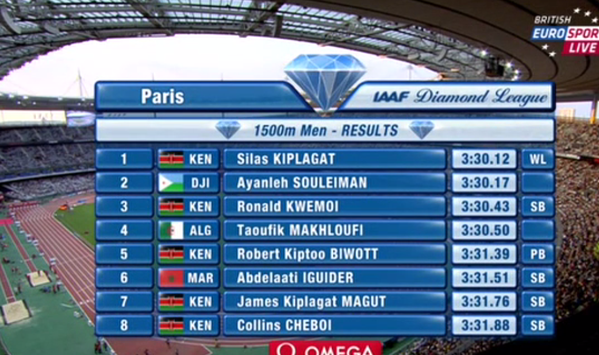 For me, one of the most exciting races of the day came in the men’s 1500m. The Olympic Champion, Makhloufi took on the pace after running a very impressive 2:23 1000m previously this week. He would painting this strong pace of 1:52 through 800m until the final 100m where Silias Kipligat and Souleiman challenged the lead. 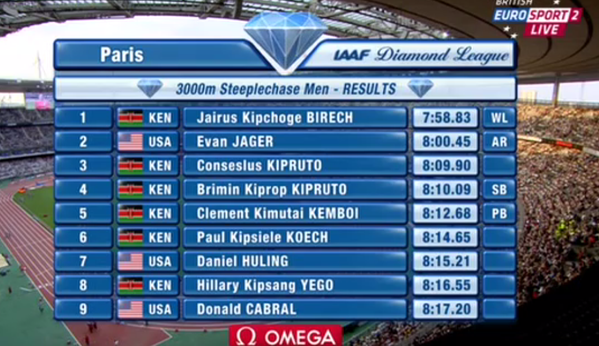 Kipligat had the speed this time to take the victory, just missing out on the first sub 3:30 clocking of the year, winning in a time of 3:30.12. This race was set up to be the big race of the day. The two fastest women in the world this year, Genzebe Dibaba and Almaz Ayana would go head to head in a battle to break the world record which stood at 14:11 by Genzebe’s older sister Tirinesh, set four years ago. However, it would be realised very early on that they would struggle to hit this record, the pacing duties were poorly handled with a very weird, undulating pace that is very difficult to run. For the and record attempt, you need a consistent string pace which doesn’t surge at all, allowing you to get into your running. This was far from the case here after Ayana throwing in a 63 second lap, 5 seconds per lap faster than what was required for the record. Inevitably, this would result in a subsequent 73 second lap. 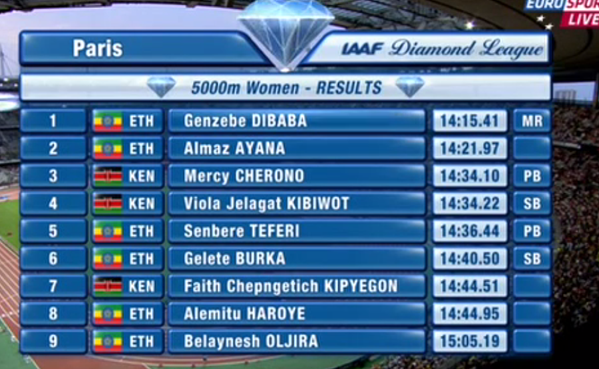 The two of Dibaba and Ayana would be miles ahead of the rest, hitting 3000m in 8:36 which was 6 seconds outside of the record pace. The time would continue to slip and Dibaba just waited and waited until the last lap where she was easily able to kick away from Ayana in a 61.17 second last lap to win in 14:15.41 and Ayana finished in 14:21.97.